UAMS Provost Stephanie Gardner, left, and UAMS Chancellor Dan Rahn applaud Dean Keith Olsen at the conclusion of the investiture ceremony in his honor. April 7, 2017 | April 7, 2017 | Keith Olsen, Pharm.D., dean of the University of Arkansas for Medical Sciences (UAMS) College of Pharmacy, was invested April 6 as the recipient of the College of Pharmacy Dean’s Chair. 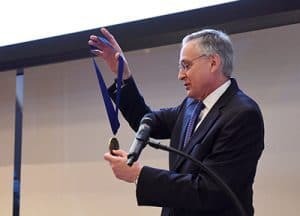 Olsen was presented with a medallion commemorating the investiture by UAMS Chancellor Dan Rahn, M.D., and Stephanie Gardner, Pharm.D., Ed.D., UAMS senior vice chancellor for academic affairs and provost. Gardner addresses the audience at the Dean’s Recognition Dinner at the Clinton Presidential Center. An endowed chair is among the highest academic honors a university can bestow on a faculty member and is established with gifts of at least $1 million, which are invested to support the activities of the chair holder. Those named to a chair are among the most highly regarded scientists, physicians and professors in their fields. A chair can honor the memory of a loved one or may honor a person’s accomplishments. 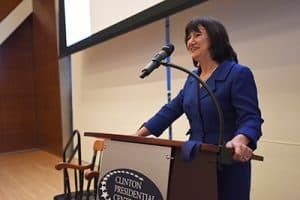 The ceremony was held in the Great Hall of the William J. Clinton Presidential Center as part of the Dean’s Recognition Dinner, an annual event to acknowledge and thank donors for their financial support of the College of Pharmacy. 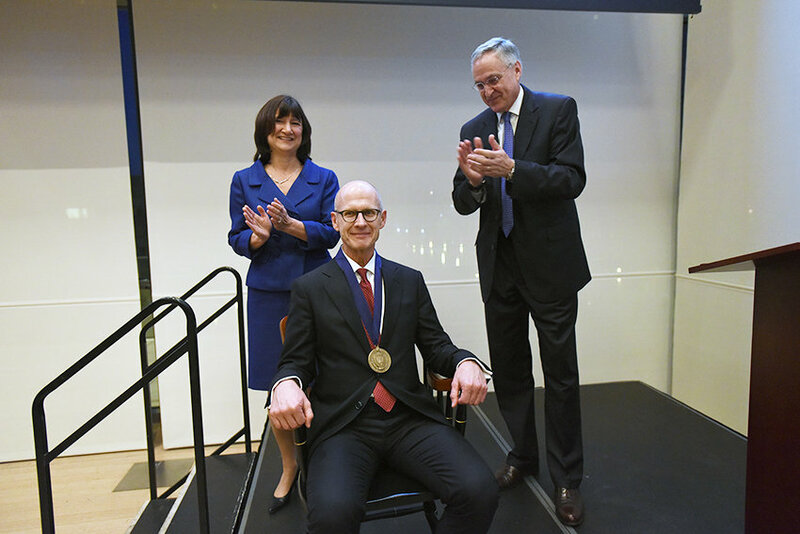 Established in 2010 with financial contributions from more than 60 donors, the Dean’s Chair was first held by Gardner, who preceded Olsen as College of Pharmacy dean. Income from the endowment assists the dean in supporting new academic programs, faculty recruitment and retention, and student leadership. Rahn shows the audience the medallion that is about to be given to Olsen to mark his investiture in the Dean’s Chair. Olsen joined UAMS as the college’s dean in Nov. 1, 2015, from the University of Nebraska Medical Center College of Pharmacy in Omaha, Nebraska. Before that he had been a member of the UAMS faculty from 1985-1993, serving as assistant professor then associate professor and director of Clinical Pharmacokinetic Laboratory and Monitoring Service. In addition to serving as dean, Olsen is a professor of pharmacy in the UAMS College of Pharmacy and a critical care specialist. He earned his Pharm.D. and completed a residency at the University of Nebraska Medical Center. He is recognized as a fellow of the American College of Clinical Pharmacy and the American College of Critical Care Medicine. Graduating doctor of pharmacy classes have recognized him three times as the teacher of the year. Olsen has published more than 300 peer-reviewed publications, abstracts, and book chapters in the areas of critical care pharmacotherapy, and infectious diseases. He was elected as a regent for the American College of Critical Care Medicine and served from 2010-2016. In 2017, he was elected its vice-chancellor. Olsen also was elected to the Board of Trustees Research Institute for the American College of Clinical Pharmacy-2012. He is one of the co-developers of an infectious diseases rapid diagnostic certification program for pharmacists.